In the 1930's, Los Angeles came of age. Streamlined architecture, often playful, but always dramatic, was the style of the moment. Banks, theaters, hotels, residential and public buildings sprang up all over the city in the new Deco style. It was an almost perfect match with the fantasies coming out of the Hollywood studios. 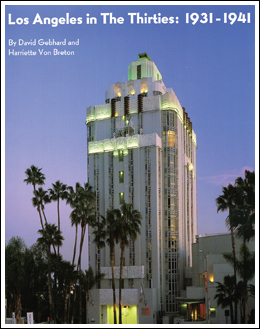 This book takes a look at the built environment of Los Angeles and the people who created it. 185 pages, TPB, 225 B&W illus, 8-1/2" X 11"